Ana Vergara, elected to the Society for the Advancement of Chicanos/Hispanics and Native Americans in Science national board. 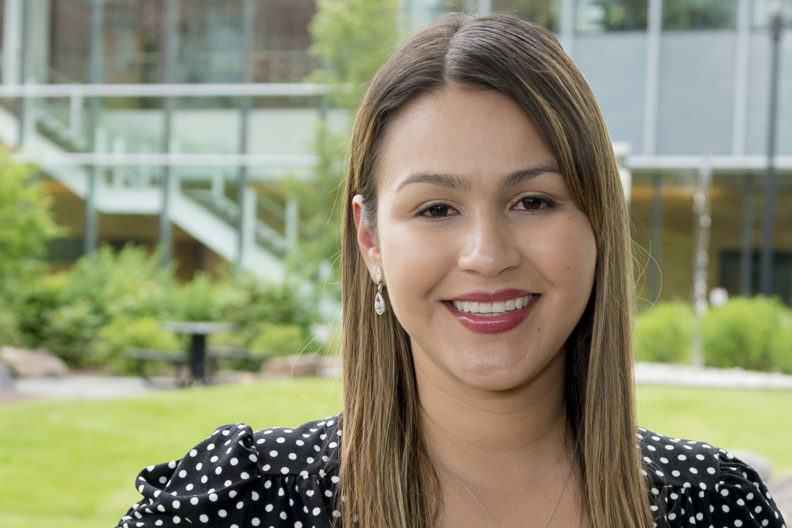 Spokane-based graduate student Ana Vergara has been elected to the national board of directors for the Society for the Advancement of Chicanos/Hispanics and Native Americans in Science. Her term begins in January 2019. “We are excited to welcome on the new board members. They bring a wealth of experience from their professional backgrounds and from their involvement with SACNAS over the years,” said Lino Gonzalez, president of Society for the Advancement of Chicanos/Hispanics and Native Americans in Science (SACNAS). Vergara is a Ph.D. student at the Washington State University College of Pharmacy and Pharmaceutical Sciences. She works in the research lab of Philip Lazarus, and studies how the metabolism of major carcinogens, mainly in the lungs, are influenced by certain enzymes that may be able to indicate an individual’s risk for certain cancers. Vergara is the sole student elected to the board this year and joins one other student board member. Other incoming board members are from University of Kansas, University of Texas Southwestern Medical Center at Dallas, and Iowa State University. Vergara graduated from Columbia Basin College and from WSU Tri‑Cities with a Bachelor of Science in biology and a minor in chemistry. She chose the WSU pharmaceutical sciences program in Spokane because it gave her the opportunity to be close to her family and still get a great graduate research setting. WSU College of Pharmacy and Pharmaceutical Sciences has a reputation for developing leaders in the field and providing students with opportunities to participate in leadership and advocacy on a national level. SACNAS provides leadership development, career resources and science advocacy opportunities through activities at over 100 student and professional chapters, and through conferences. It is an organization dedicated to supporting the success of Chicano/Hispanics and Native Americans in attaining advanced degrees, careers and positions of leadership within STEM (science, technology, engineering, and math) fields. Its goal is to achieve a diversity in STEM fields that reflects the demographics of the population, including in leadership positions.